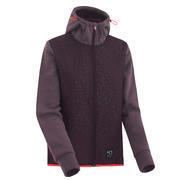 Obtain a new level of comfort with the Kari Traa Emma Hybrid Jacket. This hooded midlayer with a relaxed look has ultra-soft fabric, a unique pattern and is water repellent. The hood is adjustable and a full zip allows for quick ventilation when needed.